NuGet Gallery | Packages matching Tags:"ini"
55 packages returned for Tags:"ini"
INIDatei ist ein Namespace, um schnell und präzise .ini-Konfigurationsdateien zu erstellen und einzulesen. Extension on IniWrapper that uses Ini-parser library to parse ini files. SharpConfig is an easy-to-use CFG/INI configuration library for .NET. Nini is an uncommonly powerful .NET configuration library designed to help build highly configurable applications quickly. A single cs class to read and write INI files. This INI file handler is a single class that add instant INI reading and writing to your projects. Dapplo.Ini adds ini configuration with static type support to your project. Simple ini parser: Read/Write from/to string/file. Section inheritance. 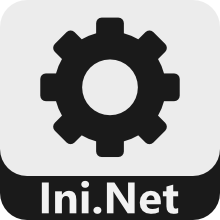 The Ini.Net is a simple .NET library for handling INI files. Reads and writes INI files and make navigating them easy. Can be used with .NET 2.0 or higher. Also includes a built in editor. Just call IniDocument.ShowEditor(). NEW: Simple object can now be serialized/deserialized. A .NET library for reading and writing INI files.